As 2016 is passing along quickly, it seemed a good time to provide a overall update. Also, a major milestone in my cockpit building adventure has been reached. With the rudder pedal installation, I have finally removed the last piece of non-737 specific hardware in my cockpit. No more GA equipment means a full Boeing commitment. More importantly, I want to extend a huge THANK YOU to all of my visitors for your continuous support. Maintaining this site motivates me as much as the flying does, so I appreciate all of your comments, feedback, and questions! I also added an External Links page to act as an online directory for the many products and other simmers out there today. TIP: Don’t forget to check out my Visuals page, it is like a running timeline of my cockpit build! Back when I decided on building only half of the cockpit (SSTD), this is what I imagined it looking like. Now, it is time to just fly the thing. Perhaps I will finally start using my VATSIM account and look at virtual airlines to join. Either way, I think I have finally earned some time off to just enjoy it. I know some people may not find this post all that interesting, but it does allow me to keep track of where I was, where I am, and where I want to go with the simulator. I hope it was informative and thank you again for stopping by. P.S. 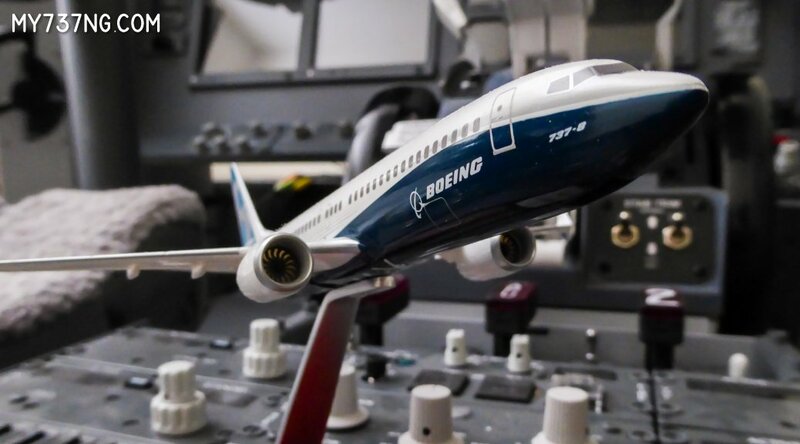 A keen eye will note the model in the photograph is the new Boeing 737-8 MAX. I am just an avid 737 fan and will be keeping my as it is. Going to the MAX cockpit is not feasible right now, and I like all the buttons, knobs, and switches in the NG!